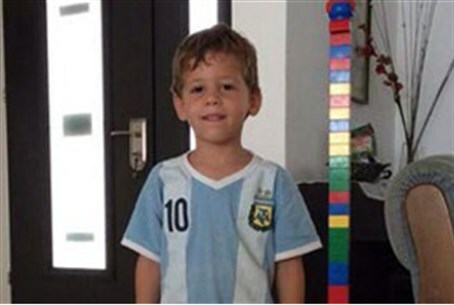 Four year-old Daniel Tragerman, hy"d, the victim of Friday's mortar fire on Kibbutz Nahal Oz, was laid to rest Sunday morning at the Hevel Shalom cemetery in the Eshkol Region. Daniel's mother Gila eulogized him. "I do not understand what's going on at all, sweetie," Gila stated. "I cannot believe I'm here to say goodbye." "We were the happiest family in the world and I do not accept this," she added. "My Daniel, we want to thank you for teaching us to love, to smile, and for giving us many moments of joy in such a short time. You're smart, sensitive, beautiful." "I find comfort in that you were a child who was loved, and who was happy, until his last moments," she continued. "We wanted to protect you, but even the 'code red' siren did not protect us." "God in heaven, strengthen us, give us the strength to continue," she concluded. "We left you your Spiderman costume you loved so much [...] we don't want to say goodbye." President Reuven Rivlin also spoke at the funeral, and carried Daniel's casket. "[Daniel] has paid the price of living in Israel in blood," Rivlin stated, addressing Daniel's parents. "No one has the right to require you to stay here, but we assure you that you are not alone." Daniel was reportedly at home when the shell was fired Friday, directly hitting a car that was parked near the home. Unfortunately, Daniel did not have enough time to reach a secure area and was hit by shrapnel. Magen David Adom crews who were called to the scene tried to resuscitate Daniel but were unsuccessful and pronounced him dead. Early Saturday, the IDF clarified the circumstances of Daniel's death, saying Hamas terrorists from its "military wing," the Al-Qassam Brigades, had fired the deadly mortar shell from a site "adjacent to the Jafar Ali Ibn Taleb school in the Zeitoun neighborhood of Gaza City." An army statement early Saturday said the facility served as a "shelter maintained by Hamas authority", correcting an earlier statement in which it had stated it was an UNRWA-operated facility.